Gansbaai (Goose Bay) is a small nondescript little town 165 kms / 2-hours 15-minutes’ drive from Cape Town, over Sir Lowry’s Pass, through the quaint sea-side town of Hermanus, and onto Gansbaai. This is a beautiful 2-hours drive, but unfortunately few divers transferring from Cape Town to Gansbaai will appreciate the scenery that they are travelling through, because they depart Cape Town at about 04h30 and arrive in Gansbaai at abound 06h30, when it’s still dark! 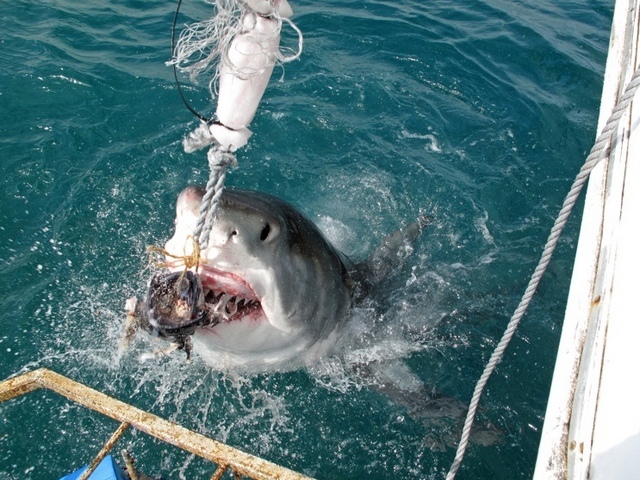 Until the start of “commercial” Great White Shark cage diving in South Africa in the early 1990’s, Gansbaai was unknown. There was a “largish” harbour, a fish canning factory that employed the majority of the people in the town, a lot of local private fishermen, large kelp beds, and Perlemoen (abalone) farming and poaching. That was Gansbaai. Then it was discovered that the Gansbaai coast was home to a huge population of Great White Sharks. 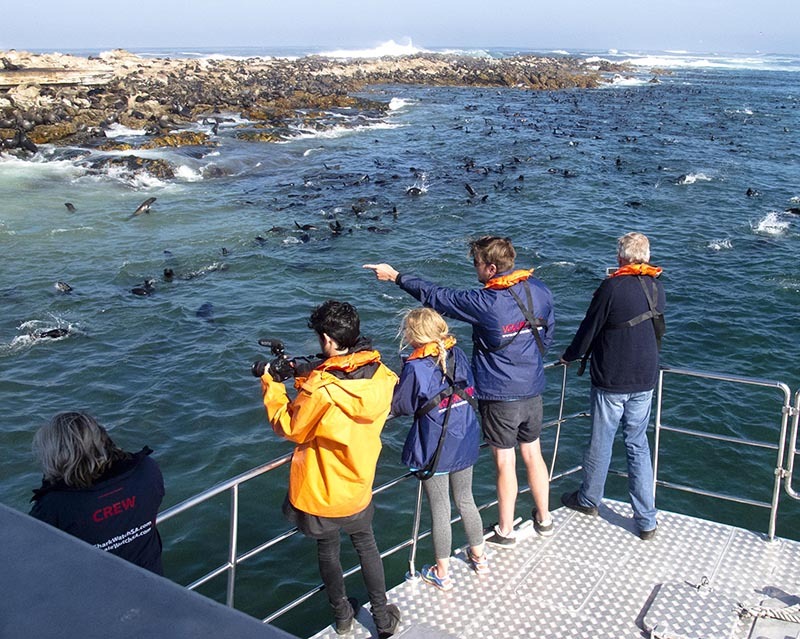 This was due mainly to the very large concentration of Cape Fur Seals in and around the Islands known as Dyer Island, and Geyser Rock. 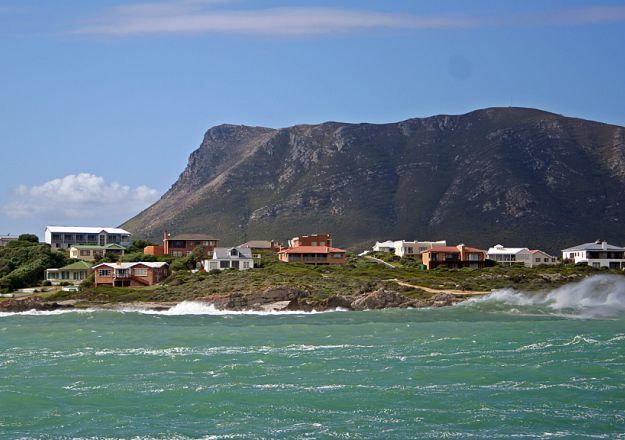 These two islands are 7-nautical miles or a 20-minute boat ride from Kleinbaai Harbour. Dyer Island is a protected, and patrolled, bird sanctuary, where the warden, who lives on the island, actively chased the Cape Fur Seas off the island, as they predate on the birds eggs, and birds, if they can get hold of them. 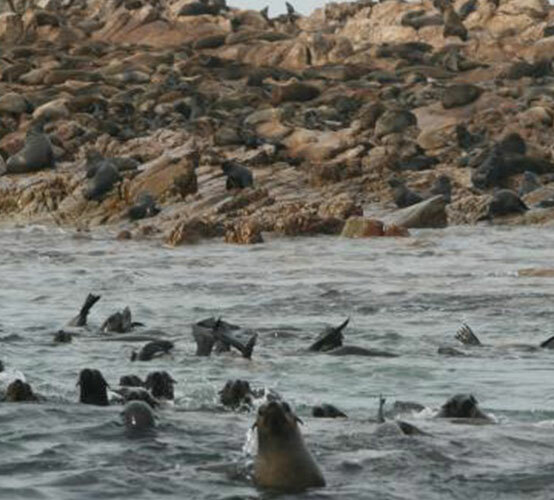 Geyser Rock is a tiny island, separated from Dyer Island by a natural, shallow channel, about 15 meters wide and about 150 meters long, and at any one time, there are as many as 60 000 Cape Fur Seals on the island. They use this island to rest up after their hunting expeditions, to mate, and to pup (give birth.) Surrounding these islands, and all along the mainland coast are huge kelp forests which form a safe haven for the seals in which to play, hide from the Great Whites, and to give cover to the Seals when they leave the area to go far out to sea to hunt, and again, to give the Seals cover on their return to Geyser Rock. The Cape Fur Seal is the favourite prey species of the Great White Shark; hence the large number of Great White Sharks that are found in the area. The Great Whites are all there, with the main purpose being to hunt the Cape Fur Seal in the areas off Dyer Island and Geyser Rock. 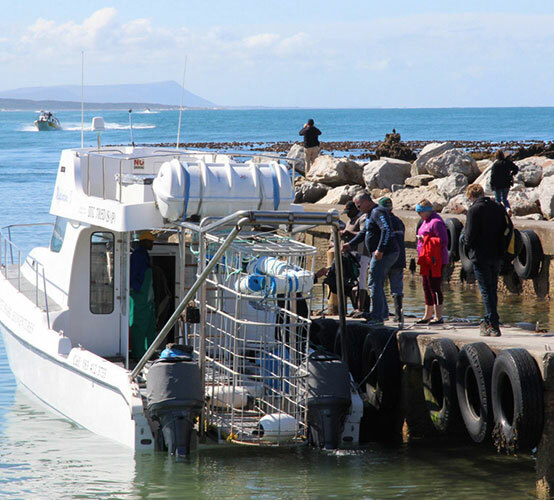 All Gansbaai Great White Shark cage diving operators have their operations / dive shops based in Kleinbaai and launch their dive boats out of Kleinbaai Harbour to go Great White Shark Cage diving in the vicinity of Dyer Island and Geyser Rock. From Gansbaai town to Kleinbaai Harbour is 5-kms or a 10-minute road transfer. Dive The Big 5 was the first in-bound dive tour operator, based in South Africa to sell Great White Cage Diving out of Gansbaai. This was way back in 1996, and at that stage there were only two “operators” offering Great White cage diving. Theo Ferreira’s, White Shark Research Institute, and Andre Hartman & JP Botha’s, Marine Dynamics. The White Shark Research Institute no longer exists, and Marine Dynamics is one of 8 Great White Shark cage diving operators “licenced and legal” to operate cage diving trips in the areas off Dyer Island and Geyser Rock. Great White Shark cage diving is such an emotive issue, but Dive The Big 5 is confident in the knowledge that it is ethical, and is in the best interest of the Great White Shark itself. Dive The Big 5 started Great White Shark Shark cage diving since we started offering dive tours and Wildlife Safaris to South Africa since our inception in 1996. Even then, Great White Shark cage diving was a contentious issue! What with cages, chum, bait, shark / human interaction, the sound of a boats motor as an indication to the sharks that they were in for a “free meal”, etc, etc. I could go on for ever. In the 22-years that we have been offering Great White Shark cage diving we have never had a client get off the dive boat, who has not become an ambassador for the Great White Shark! They immediately start spreading the gospel about the amazing creature that they have just been introduced to. The sceptics have all become total converts! It is Dive The Big 5’s aim to introduce as many people as possible to this magnificent creature, and in so doing, we may just help to save this beautiful, majestic, marvellous creature from extinction. It’s all about educating the masses, but time, ignorance, and human explosion is the key. Elephant poaching is exactly the same. Join Dive The Big 5 on a Wildlife Safari, and let us take you on a “trunk in hand” elephant encounter. Elephants, like Great White Sharks need as many “Elephant / Great White Shark Ambassadors as they can get!